More generally: cooking, gardening, and deliberate growth. 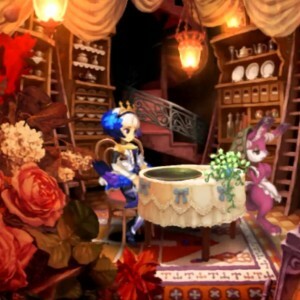 Odin Sphere is a roleplaying game, but it doesn’t work like most RPGs. You don’t earn experience points by killing things or practicing your skills. Instead, you have two character growth gauges: Psypher Level and HP Level, which govern attack and defense ability respectively. Psypher Level increases when you absorb sparkling Phozons, which drop from enemies and certain plants; HP Level increases when you eat food, which you get from growing plants with Phozons and potentially combining them in recipes. This interaction of resources means that you’re constantly balancing Psypher and HP leveling: they both use Phozons, and you must be conscious of both in order to maintain your ability to overcome the game’s challenges. 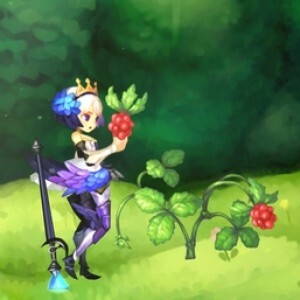 My memories of Odin Sphere are filled not with fighting dragons or maudlin romance, but with nurturing Baromett plants to grow sheep or hunting for Mandragora to dig up and collect. Preparing comestibles is essential to survival. Besides gaining experience to increase your maximum health, you’ll need healing from food and protection from various potions. In some areas, you need a protective potion to avoid taking constant heat or cold damage (unless you’re willing to give up a precious accessory slot for a protective item). Potions require their own preparation process: they need a Material of a certain value. You can increment the value of a Material by combining it with another item, or you can dramatically increase their value by combining two Materials. Their value is multiplied, with the units digit of the product becoming the value of the resulting Material and a number of Phozons released equal to the tens digit of the product. The Materials are then combined with ingredients grown and gathered in the world to create potions. This is the loop of Odin Sphere. Make sure you have enough bags to carry your forestry supplies. Plant seeds before you start a fight, to make use of the Phozons released by the enemies. Harvest the fruit before it becomes overripe. Scan the ground to find buried Mandragora. Eat what you need, keeping track of the seeds released. Hatch an egg, raise it, feed it seeds to make more eggs. Slaughter the chicken and eat it, then use the bone to increase the potential of your Materials. Plant another seed before crafting your materials to absorb any Phozons that are released. Absorb any stray phozons. The depiction of food and plants in this game is loving and cozy. The Pooka restaurants accessible between trips into combat zones provide increased benefits when you supply them with the ingredients for their cooking. Their artwork might be even more of a benefit, though. The warm glow of a hearth, the dangling pots and pans, the blush of a table setting, and the carefully-arranged china on a shelf. 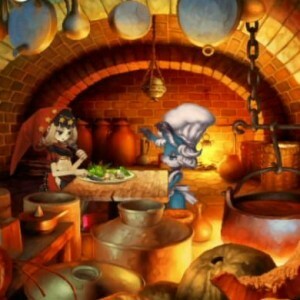 Odin Sphere is a story-heavy roleplaying game with a fun fighting-game-style combat system, but that all pales in my mind in favor of the experience of planting, nurturing, mixing, and balancing my assorted needs for food and power. This game rivals Morrowind in my mind for presenting a world that I feel I know well enough to want to eat there. I’d like to go out digging for Carroteers and pet a Baromett, then return to town to dine on Muggle Escabeche à la Erion, have a fresh Napple for dessert, and toss away the core.